WHAT's Only $19.95 (OWL2/OSPD4) ! This PC-based program is for personal and club use. It is simple to use for common requests and very powerful. WHAT has extensive documentation, including tutorials and examples. The downloadable version costs $19.95, which includes three years of support, including new lexicons. Download and use the free someWHAT with limited lexicons. You can do useful work with all words with a Q plus all 2’s through 6’s. · WHAT does single- and double-word anagramming, pattern matching, anagram steals with or without rearrangement, blanagrams, etc. 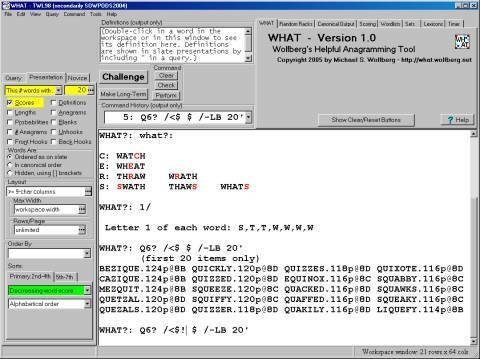 · WHAT does query filtering and output presentation by various criteria, such as word lengths, scores, probabilities, hooks, number of anagrams, etc. WHAT is the best anagramming tool for Scrabble® players! For more info visit http://what.wolfberg.net or e-mail Mike Wolfberg at what@wolfberg.net .